Bumbo seats haven’t been around forever, but their practicality when it comes to weaning has made them an almost indispensable bit of baby gear. 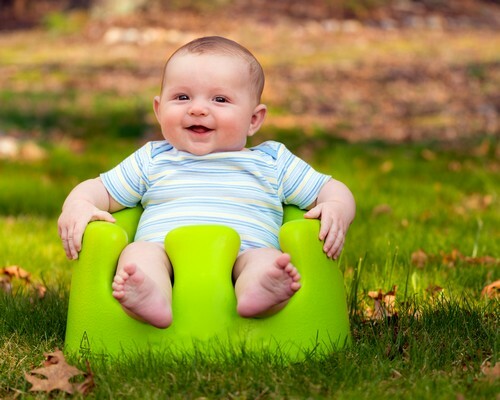 Here are the Bumbo safety tips you should know. The latest Bumbo incarnation—the Bumbo Multiseat—is suitable from 6 months up, and can be strapped to an adult dining chair using its buckled chair straps. It also works just as well as a floor seat, and comes with a feeding tray for weaning convenience. The most important safety rule when it comes to strapping your tot in is to not place the seat on an elevated surface. While your baby may be secured with the three-point harness system, the seat itself has no way of being secured to the surface it’s on. Only a dining chair is suitable because the Bumbo can be strapped onto it. In all other cases, place the Bumbo on the floor. Secondly, always make sure all straps are properly fastened; this includes the dining chair attachment straps, and the three-point harness. Your baby must be at least 6 months to utilise the seat, and must be able to sit up for an extended period of time unassisted. Finally, never leave your baby alone when they’re in the Bumbo. While the seat can free up your hands for a brief period, you should stay in the room and keep an eye on your child. This Is the Best Type of Book to Read to Your BabyThe Pregnancy Test Says Positive – Now What?